Bina007 Movie Reviews: Greta Garbo retrospective - ANNA CHRISTIE (1930) - Garbo speaks! 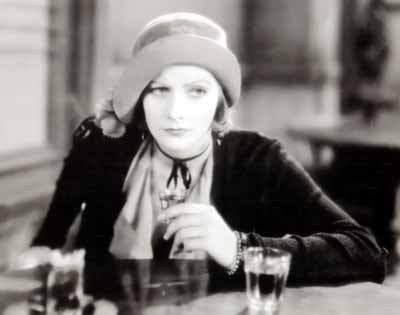 Greta Garbo retrospective - ANNA CHRISTIE (1930) - Garbo speaks! "If anyone wants to get drunk, if that's the only way they can be happy, and feel at peace with themselves ... they have my full and entire sympathy. I know all about that game from soup to nuts. I'm the guy that wrote the book." Hickey, in The Iceman Cometh. ANNA CHRISTIE is a powerful and moving film about living with two emotionally destructive forces: illusions and alcoholism. It was based on a play by Eugene O'Neill, a writer who was himself an alcoholic, and who writes with an acute perception and empathy that seems utterly modern and shocking in a major MGM movie, until you realise that Anna Christie was released pre-Code. How brave, though, for silent movie star Greta Garbo to pick ANNA CHRISTIE for her first "talkie". To shatter the illusion that her fans had of her as a brittle beauty, with a movie about a woman who is herself perceived to be virginal and pure. The reality is that rather than having milk ordered for her by her father and lover, she'd rather wash away her memories of an abusive childhood and her years as a prostitute with whiskey. The movie is a ninety minute exercise in disciplined story-telling, and the taut structure combined with director Clarence Brown's largely static camera gives the film a stagey feeling. No matter. A modern director might have tried to open the play out for the film, but with Brown - Garbo's favourite director - he was too busy opening out the emotions to care. The first fifteen minutes sees Chris Christoffersen (George F Marion), a humble sailor, brimming with joy that his daughter, an au pair, is returning home. Marthy Owens (Marie Dressler), a bar-room drunk, and Chris' friend resents his lionising of his daughter, and is only too happy when, in the second fifteen-minute segment, Anna walks into her bar and orders, iconically, "A visky, ginger ale on the side, and don' be stingy, baby." The film comes alive as these two women edge into a friendship over a shared need to drink. Anna hints that her life has been hard and that she resents that her father abandoned her to their distant family. Marie Dressler and Garbo spark off of each other, and it's a joy to watch. In the third fifteen-minute segment, we see Anna and her father on their boat. Her father is reluctant for her to take to the sea, fearing it's no place for any proper person, but Anna, melancholy, comes to love it. And so, we sail into the second half of the movie. A storm strikes, and a fellow sailor appeals for help. So, Anna meets Matt Burke (Charles Bickford). Initially, she resists his advances, and we sense that she hates men just as her father hates the sea. But slowly they settle into a kind of domesticity on the boat and fall in love with each other. This prompts a proposal, and the final twenty minutes of the film gives us the full dramatic results of that. Anna feels she can't accept until her father and lover know the full truth about her. This is Garbo at her best - strong, honest, upright, and yet vulnerable, damaged, self-sacrificing. Ultimately, through revealing the truth, she becomes the stronger person, leaving the men around her with their shattered illusions - literally throwing them off of her as each one grabs one of her arms as though she is a rag doll to be fought over. The irony is that she becomes strong by revealing her vulnerability - the truth about how damaged she is. ANNA CHRISTIE is a wonderful film - raw, honest, perceptive, powerful. Garbo gives an amazing performance and dominates the screen, and Marie Dressler is fine in support. But ultimately it's O'Neill's play that is the strength of the film, with its empathy for the damaged alcoholic and its need to confess all. ANNA CHRISTIE was released in 1930. Garbo, Clarence Brown and William H Daniels were nominated for Oscars but Norma Shearer for THE DIVORCEE, Lewis Milestone for ALL QUIET ON THE WESTERN FRONT and Joseph T Rucker and WIllard Van der Veer for WITH BYRD AT THE SOUTH POLE respectively.